YOU HAVE A CALLING IN LIFE THAT ONLY YOU WERE BORN FOR! Powerful Women can play any role in any outfit! Be unique and be phenomenally you! You were born at a particular time in history for a reason and the alignment of all the energies, circumstances and experiences of your life since birth are what make you uniquely you. No one else on the planet is better at being you, than you! How fabulous is that. It also means that your mission in life, the blueprint or pattern you set for yourself, is also beautifully unique to you. Don't you think you should truly OWN that? What you decide to do with the abilities you were born with is what will either make you or break you. I believe that the point of being alive is to take that personal blueprint/pattern out into the world and discover as much as possible which will give you the greatest chance of evolving into the whole person you are intended to be. Knowing this, doesn’t it make sense to nurture yourself for the journey, fight for the mission and learn to love the knowledge and experience you gain along the way? It truly is a privilege and a blessing to be who you are. So your real job (not the one you work tirelessly 9-till God knows when for) is to honor your blessings and then share them with others. Therefore your purpose is simply - to be exactly who you are! And your mission - to be just that, but at your greatest potential. What an exciting concept and fulfilling journey to go on. Choose your role and play it out to the best of your ability. Everyday people fight for relationships, jobs, careers and businesses, so why not fight for the right to be you? Are you not the most important component of your life? You absolutely 100% have to be, for without a wholesome you, none of the other stuff even matters. A HEALTHY, HAPPY, WHOLESOME HUMAN HAS THE CAPACITY TO CREATE BEYOND LIMITATION. Choice is the ultimate in luxury, so treasure its value. just imagine your life for a moment without it. Now look at the endless possibilities you have with it! Aren't we lucky? When you understand the limitless possibilities of choice and indeed perspective, you will find that anything is possible and there is a way out of every difficult situation. It may not always be conventional, easy or nice, but there is always a pathway, because as long as there is choice and perspective, there is a way. Whatever missions you choose to set for yourself this year, just remember don't allow the noise of other people drown out the beauty of your own inner voice. Always trust your instincts and enforce determination to stick to your path. Do not be swayed by other. Remember your journey is not theirs to go on. Stay in your lane and focus phenomenally forwards. Be brave enough to enjoy your uniqueness and remember, no-one else on the planet can do the job of being you, better than you! Your only real job in this life is to discover your potential and then find out what that means to you as an individual. If you set your mission sights high enough the results are potentially phenomenal. How wonderful to know that we are truly responsible for our own happiness and success in our lives. I refuse to believe I was put on this planet to just pay bills, be hurt by ignorance or crippled by jealousy and then die. That’s absolutely not acceptable in my book. I believe I have a phenomenal mission to go on and one that will not only allow me to live a life that serves me, but that serves others too. I also believe the same for all of you. We as women are needed, useful and worthy human beings, we are individual, smart, funny, charming, wonderful creatures and therefore have an obligation to be as phenomenal as we possibly can. Why not give yourself the chance? I believe the mission is possible! No matter how harsh the weather may regroup, refresh and then head out back out the door again. 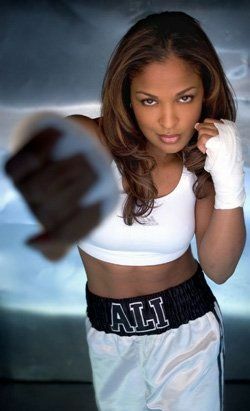 Like the phenomenal Laila Ali here, no matter what, get back in the ring of your life and pack your best punch. As for the punches we get back in life, well they are simply lessons to wake us up to the next phase of our journey. Life's alarm clock if you will. It's there to keep you moving forward so that you can create and achieve your own phenomenal life. WE ARE ALL SIMPLY RESEARCHERS ON A JOURNEY TO FULFILLMENT. SIMPLICITY IS THE WAY. No matter what you have going on in your life, no matter how busy you are, no matter your restrictions, always take a moment to find just one small thing that makes you happy and then reward yourself for being brave enough to fight for what you truly want. Step out into the world, discover your truth and simply live by that. A phenomenal life is one that YOU want to live and whatever that may be, I believe you can have it, if you put your 'phenomenal millionaire mindset' to it. The mission may be a tough one, but if you really want to live a phenomenal life, then you absolutely must step out of the comfort zone you’ve been relaxing in and step into the right mindset and mission that will change your life forever.